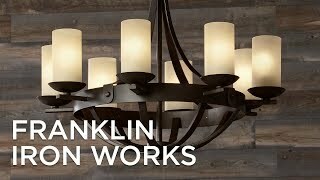 This industrial style table lamp from the Franklin Iron Works brand features a convenient nightlight with a decorative Edison-style bulb. 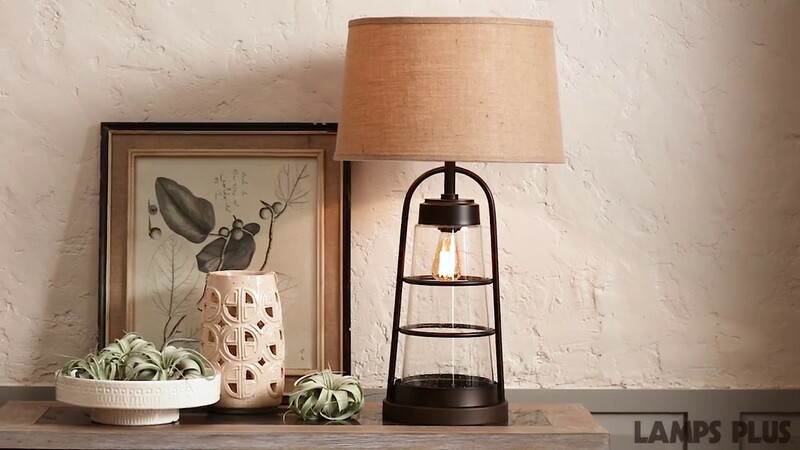 Charm and convenience combine in this lantern-style table lamp. 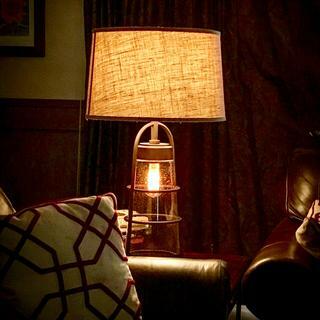 The industrial design features a cage-like base, wrapped around seeded glass, with an Edison bulb to light your way during the nighttime hours. A handsome burlap shade sits atop the design in a streamlined drum shape. 31" high overall. Round base is 10" wide. From bottom of shade to tabletop is 19 3/4". Shade is 16" across the top x 18" across the bottom x 11" high. Uses one 150 watt standard-medium base bulb (not included). Comes with one 25 watt Edison medium base bulb for built-in nightlight. 4-position switch: top light on, night light on, both on, both off. 7 1/2-foot brown cord and plug. A great look for industrial or rustic farmhouse style room decor. From the Franklin Iron Works lighting. Bronze finish. Clear seeded lantern glass body. Burlap brown drum shade. I’m placing this lamp in the living room at our camp. The decor is rather rustic with cypress walls. The nightlight will come in very handy as these lamps will be in the living area. has a night light. Modern industrial style a plus. Up-dating our living room after 25 years. New couch,new chair, area rug, and top it off with an added fireplace. Lamps should look great. Well my Nephew has been looking for this item for the past 4month. she will check once in 2 weeks. she sent me the link and i asked if it was what she wanted and she said yes. The design was amazing, I just home its really does look like it does in the picture... happy holidays. Very unique industrial lamp, love the night light feature! It is unique and beautiful and had terrific reviews. Different from what I had. Reviews were excellent! I love the industrial/farmhouse look!! I like the look of the lamp..also need a table lamp atleast 30+ in ht.. I like the height and it will fit in my farmhouse decor of my home. liked the looks. good reviews. Lantern style seems perfect for cabin in the mountains. Love the size and the nightlight feature. 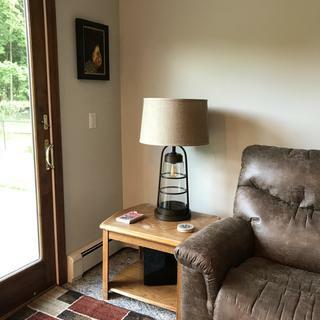 I bought this lamp to coordinate with a similar lamp I bought in 2015 from the same company. It's one of my favorite lamps. This is the style that I am in the process of changing my family room to, farm house! 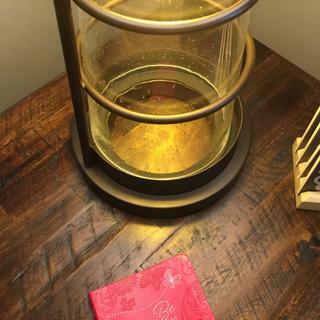 I recently visited my sister-in-law, she had just purchased this lamp. I loved it so much I had to have one also. We have been looking for new Lamps for our Living Room. As soon as we saw these we knew they were the ones. We had received a Post Card in the mail from you and decided to get on line and check out your site. This lamp was actually on the post card. Thanks for the discount code as well. Very excited to receive these lamps and see what they look like in our room. Love the Free shipping and Free returns if they do not work. I can see us doing more business with Lamps Plus. I had already purchased one and loved it so much I am going to purchase another! I love the lower bulb for when I dont want so much light. Its the best lamp I have purchased everywhere. It is a great quality.. I wanted something rustic, tall and would put out a lot of light in a big room. Love the look. I have a lot of wood pieces in my family room and needed something different to compliment my rustic look. It's different without being tacky and like the night light feature. I hope it works! We are remodelling the living room. 150 watts incandescent is too much light for my needs. Is anyone using a lower wattage, say 60W? Is anyone using an LED bulb for the top, and if so, with what results? Thanks! BEST ANSWER: Hi - Using a lower wattage and LED bulbs is absolutely fine. I use a tiwin 11w LED soft white lightbulb. Works well, great light, has been in there for a couple years. Thanks! Just what I was hoping to hear. Can a dimmer switch be used for the main light? BEST ANSWER: I’m not sure how you would add a dimmer switch to it. The 4 way switch already is on the lamp and it can’t be hardwired so I would say... no. Not really. It does not provide much light. Love the lamp but i like using 3 way light bulbs , not sure the switch can support the 3 way and night light hope im wrong ! Need help please ? BEST ANSWER: I'm not using a 3 way bulb, but I think you're correct that it won't support it. One click, turns on only bottom (night light) bulb, one click turns on only bottom bulb, and one more click turns both on, and then one more click turns it all off. on my end tables which are 23" high? BEST ANSWER: how big is your bedroom? If your room and furniture is on the small side then they might be overbearing but if your room and furniture is on the medium to large size then I would say they would be the perfect size. 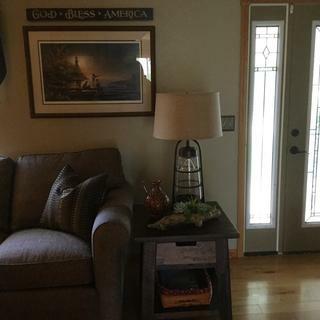 I bought 2 of these lamps in 2017 - love them- my end tables are 27" high and they are perfect but my ceilings are 10 ' and the room is very large so not sure if that applies to your situation. I hope this helps. I have the lamp on a 22" end table and it looks perfect. I don't think and inch would make a difference. I have one sitting on a standard end table and the heights works fine. If this is a cordless lamp, how do you charge the battery and what is the lifetime of the battery before charging is required? BEST ANSWER: Hi, the table lamp is not cordless. It has a 2-prong plug that connects to a 120V AC. It is not a cordless lamp. It has three stages. First the nightlight comes on, then the main lamp comes on, then they both come on. We bought two of these and the matching floor lamp. We love them. No, it has a cord out the back bottom of the lamp. I did my search on outdoor/wet rated table lamps. 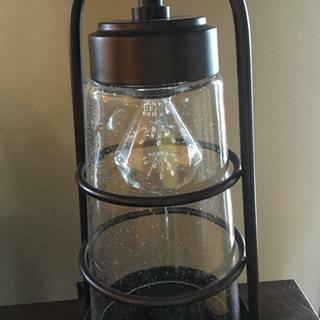 This lamp came up in my search, I like it , but do not see outdoor/wet rating in specs. Is this lamp outdoor rated?? BEST ANSWER: No, this is not designed nor rated for outdoor usage. But, I have added a link below for some great options for you to start viewing. I don’t believe so. Although the base is metal and glass, the shade is fabric and would be damaged in a wet environment. I also don’t see any waterproofing. It is very heavy and stable, so I suppose it could be used outdoors in a dry, even windy, environment. We have two of them and even got a matching Franklin Iron Works floor lamp. We are happy with all of them. I love this lamp; when I received it didn't say it was for outdoors - and I wouldn't take the chance. is there a smaller version available? 10" base is a bit large for my table. BEST ANSWER: There are no other size options available in this collection. What is the width of the shade...top and bottom? BEST ANSWER: The shade is 16" across the top x 18" across the bottom x 11" high. What size light bulb do I need to replace the Edison Bulb. Is it a regular sized base or one of the off sizes? BEST ANSWER: The Edison bulb is a medium sized base. How do you change the bulb in the night light? BEST ANSWER: Hey Sally... we have these lamps in our bedroom and absolutely love them with Edison style bulbs in them... but to answer your question, all you have to do is reach up through the bottom of the lamp. The designers cleverly included an ample sized opening in the felt trim ring on the base. I haven't changed it yet but I believe you just put it in from the bottom of the lamp. Put your arm up the center and remove then replace with new one. The base of the lamp is open so the bulb can be inserted there. Reach up through the open bottom in the lamp. Reach in from the bottom. It's open. Does a three way bulb work in this lamp? BEST ANSWER: No. It has 2 bulbs. A 150W bulb which is fine for reading, and a low-wattage "Edison Bulb" which is great as a nightlight or as "mood lighting." They can be on separately or together. This replaced a 3-way lamp I had previously. Without a doubt, this is the coolest lamp I have ever owned. I never thought I'd love a lamp. If you are set on 3-way keep searching, but if you want a really cool, different, functional lamp that is a real show-stopper, give this a good look. Are these lamps 3 way? BEST ANSWER: Yes! The top lights up by itself, the bottom can light up by itself, and then you can have both on at the same time. It's a great lamp, we love it. The lamp function is not 3 way. There are 3 settings to choose from - night light only, lamp only, or lamp and night light together. Lamp has two bulbs; there are three types of light-one with lower bulb lit, one with upper bulb lit. And one with both bulbs lit. Yes - the bottom lights only (dim)or just the top (bright) or both can be on at the same time. ( super bright) love these lamps! No, however, it has three lighting options...the lamp itself, the Edison bulb alone, or both on at the same time. what is the height of the lamp shade? BEST ANSWER: The height of the lampshade itself is 11". The height of the lamp overall, including the lampshade, is 30.5". 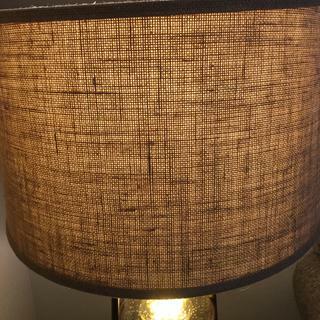 The shade is 11 1/4" inches so the height of the lamp overall is 30". This is a gorgeous lamp that is very unique. It is a nice transitional piece that works will with Eclectic, Country or Industrial-themed decor. It's been a fabulous conversation piece. The only draw-back is that the Edison bulb is somewhat bright as an accent, but that issue can be resolved by installing lower wattage. It illuminates well and also has a nice feature fpr the glass base to be a nightlight. We hope you like the photo styled by @stephaniespahn - look for more exciting images and video on our product pages! 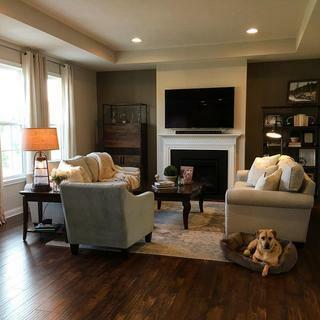 Wanted to change the look in my family room. The recessed lighting was not conducive to reading and not warm and welcoming. This lamp is prefect. Its great to read by. It makes the room seem very warm and cozy. Everyone loves this lamp. I bought two of these lights to use on end tables next to a king size bed in the master bedroom of my beach house. They blend in perfectly with a ceiling fan with light in the same room. I love the night light as well as the total look of the light. I always go for an unusual look not one you see everywhere and these lights fit the bill. Love the 2 bulb feature!! I use the table lamp and the floor lamp in my livingroom and it looks elegant. I use the lower light for ambience and I use the bright, upper light to read. Arrived in timely manner, packaged well. Delivery was very prompt and everything was packaged well, no problems. Love,love,love this lamp. The perfect industrial look. Delivered in the stated amount of time. Package was in good condition and the lamp was well packed. In fact, lamp was purchased as a gift and, due to illness, we had to send onto Atlanta from Texas and it arrived there in good condition too. Lamp came in perfect shape & was well packed . I would definitely recommend this lamp it is well-made and looks great! The night light feature is a good light to have if you're watching a movie and you want to leave a little on so that you can still see your coffee! Beautiful lamp, perfect in every way. Looked for months and finally found the perfect combination of Rustic/Farm. The night light in the bottom is a wonderful bonus. The staff at the store were extremely helpful and pleasant to work with. Really like the look of it. This lamp helps complete our updated hang-out room! The lamp is everything I expected it to be-great quality! Love this lamp. My children got me the floor lamp to match this. Loved it, so wanted to get the table lamp to match. Love that it can also be used as a night light! Love these lamps. The design with the Edison bulbs make this a great piece! Very nice lamp, I love it! This lamp was awesome! Way better in person, is bigger than expected , but still great!!! Highly recommend these lamps. Used as bedside lamps. Lamps are beautiful. Very well made. We had an issue where the glass was cracked despite the packaging being some of the best I’ve seen. Customer service took immediate action and is sending a replacement part. Very nice lamp. It is exactly what I was looking for my living room. The lamps are even more beautiful in real life than they are in the pictures. 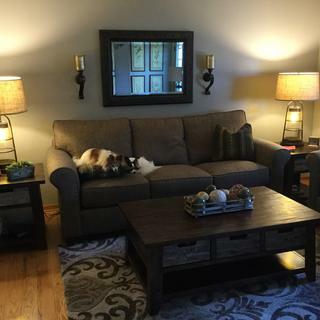 I purchased two for my living room and they really made the room look upgraded. Thanks for your quick service. We love this lamp! Great look and well made! We are extremely happy with this lamp. I am so in love with my lamps, love the style!! It's a "normal" lamp with a 150W bulb under the shade. It's also a nightlight or mood light with a low-wattage Edison Bulb in the glass base. The bulbs can be on separately or together. I love it. My only suggestion would be to have separate switches for the 2 bulbs. I highly recommend it. It will be the best table lamp you have ever owned. I really love these lamps. I do like this lamp but it appears larger than I thought it would in person. 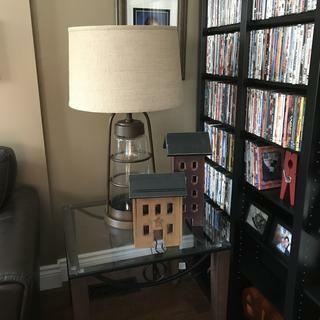 The lamp fits perfectly in our family TV room. We are very happy with the purchase. We wanted a "coastal" feel to our sunroom. This lamp fits perfectly. Highly recommend this lamp. This lamp makes a perfect statement in my living room. It’s better than the pictures. Burlap, Seeded Glass, Bronze iron and nightlight. Awesome. These are large lamps. They make a statement. They also have the ability to put on a lot of lumen power. Rated for 150w on top and they come with a 60 w led bulb for base. I had to tone down the nightlight bulb an replaced with a 5w I found on amazon. Super easy to assemble. I love these lamps. We highly recommend these lamps. They are substantial in size and very well made. Good lighting when needed and the night light gives a warm cozy glow to the room. Large and awesome table lamp for an Industrial look! There was a large crack in the glass body of one of the lamps when it arrived (it happens). Lamps Plus immediately authorized me to exchange it and provided me with a prepaid label for shipping. Couldn't be easier. Excellent customer service, at a time when many companies seem to not understand the term. Thank you Lamps Plus for a job well done! An off-white rectangle shade tops the whimsical fish base of this charmingcontemporary coastal table lamp with a night light in its base. 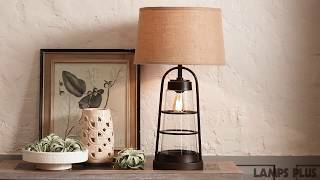 Add a stylish accent to an end table or console table with this antique brass table lamp topped with a cream linen lamp shade. Inspired by the Old World charm of a lighthousethis nightlight table lamp is paired with a fresh white linen shade.